Let me talk about a little trend that you may or may not be aware of. The term “SUV” is on a high trajectory as the family conveyance for the good ol’ U.S. of A. We prefer them to cars – a lot. Some, as demonstrated by a recent announcement during an earnings call, have decided to concentrate their entire automotive business on selling SUVs and Crossovers to everyone they can lure into a showroom. Keep in mind that there is an SUV for everyone and every budget. You can get them small enough to park in front of your apartment building in a densely-populated part of the city because no one had the forethought of adding parking to the rear of it. They come in every size – all the way up to ginormous beasts only found in certain suburban enclaves where the kids have access to do anything active – and exceptionally well. I think about whenever I head towards my friend’s restaurant – also known as “the clubhouse” – in the Far West Metro of the Twin Cities. We’re talking some of the most exclusive and wealthiest neighborhoods in the region, such as Wayzata, Minnetonka, Chanhassen, Orono, Long Lake, Minnetrista…and so forth. Homes that fetch over a million or so dollars – more so if you have a piece of the shoreline of Lake Minnetonka. These are the places where you can purify your souls in the lake’s water (as Prince suggested in “Purple Rain”) and enjoy the benefits of being away from the hustle and bustle of Minneapolis and St. Paul. These are where the big SUVs live. Mostly, they’re of the General Motors variety. You might see an oft Lincoln Navigator, Lexus LX 570, Toyota Sequoia, Infiniti QX80, Nissan Armada, Mercedes-Benz GLS, or any large Range Rover. But, if you go to any shopping area, you cannot ignore the plethora of Chevrolet Tahoes, Suburbans, GMC Yukons, and Cadillac Escalades. What if I threw a wrench into those tony neighborhoods. I’m certain they have heard of the Ford Expedition. They may even have one. But, what if I told you that the new version – the 2018 Expedition – is going to make those well-off families of Lake Minnetonka to trade in their big GM SUVs? First off, looks are important…even in this class. What Ford did was to distinguish itself from its competitors with a clean design that is also distinctively Ford. How so? The roofline is clean with maximum glass area for a great view out. It also has no traces of the F-150 it shares underneath below anywhere on the Expedition. 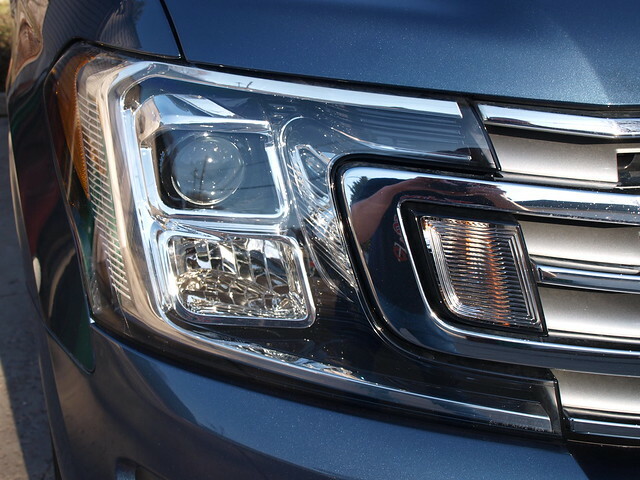 Yet there are a few cues that the Expedition employs bits from the Explorer for an SUV family look. You will find the Expedition a grander ride overall with its commanding presence and classic style. For the Limited tester, I am glad they provided retractable power sideboards with that extra assistance to step up and out of this large SUV. The rear doors are wide enough for loading onto the third row. If you really need more than what this tester offers – you can go big or big absolutely posh. Going big means selecting the Expedition Max long wheelbase model with its enlarged cargo hold behind the third row of seats – a direct competitor to the Chevrolet Suburban and GMC Yukon XL. Or, you can go further upmarket with the Platinum trim level – it is as close to a Lincoln Navigator as you can get in the Ford lineup. While you have choices, this Limited short-wheelbase model is a great start to fit with the Lake Minnetonka set. Stepping inside reveals a solid cabin that is based on the F-150. The instrument panel from the best-selling vehicle in the USA works well with the Expedition with Lariat-level trimmings for the Limited model. 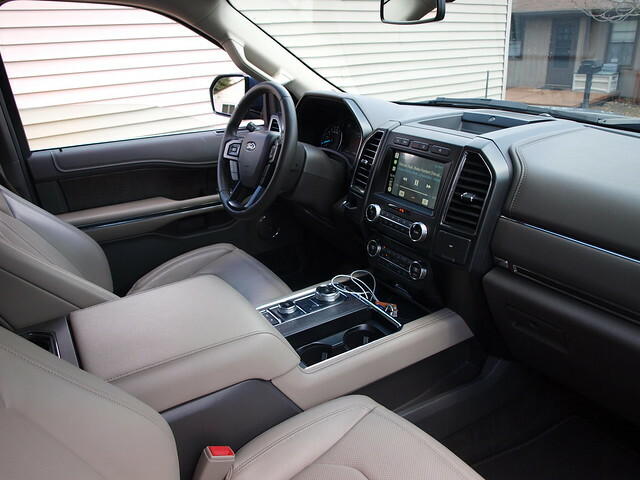 The leather is durable and comfortable, including all of the soft touch parts of the cabin. The only thing distinguishing the Expedition from the F-150 is the rotary gear selector for the automatic transmission. It is large, but I get why they did this instead of a big lever found most commonly on the pickup truck. For the short-wheelbase Expedition, there are seats for seven across three rows. The front seats are large and provide plenty of power-operated adjustments and some support. Second-row seating offers exceptional space for adults. It is also adjustable for rake if needed. Third-row access comes from a sliding outboard second-row seat for an area suitable for children. Regular Expeditions offer at least 19.3 cubic feet of space in the back, which will eventually expand to 104.6 cubic feet with the two rear rows down. The Max will offer almost double the minimal cargo space behind the third row, expandable to 121.5 cubic feet. In all, the Expedition is made for family vacations or to take a few members of the hockey or soccer team to practice. SYNC 3 may be the savior of Ford’s lineup. The infotainment system allows for connectivity to the smartphone and other connected devices through FordPass and smartphone integration through Apple CarPlay and Android Auto. Our tester came with a 12-speaker B&O PLAY audio system (by Harman) which offered superb sound throughout the cabin. 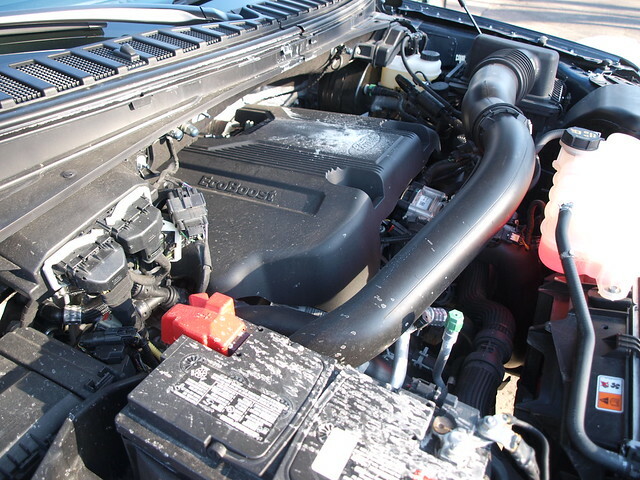 Powering the Expedition is the 3.5-liter EcoBoost V6 with twin turbochargers and 375 horsepower. With the 10-speed automatic connected to it, it a smooth driveline devoid of obtrusive shifts through the ratios. The EcoBoost is also a beast with extraordinary acceleration and constant pulling power. In fact, our tester can tow up to 9,200 pounds. Yet, it will return decent fuel economy. I experienced an average of 18.0 MPG in my care – below average based on the sticker for a four-wheel drive Expedition. The main reasons families buy big SUVs is the smoothness in ride quality. 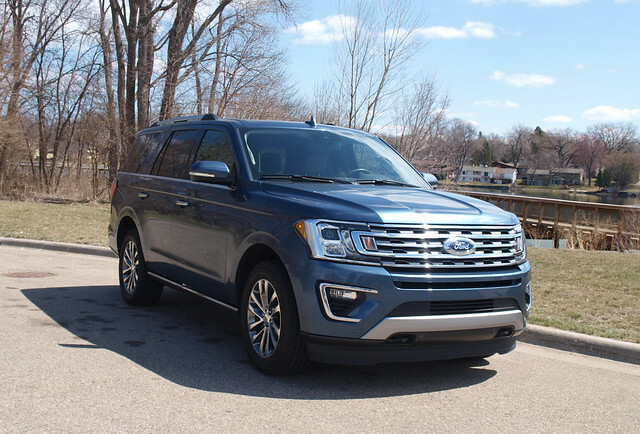 The Expedition does a superb job with its balanced and soft ride that absorbs anything below it – including potholes. Do not expect the Expedition to carve up canyons. You will find controlled lean and roll when pushed. It is always best to take a gentler approach to turns and curves. The steering rack offers a tighter turning radius than you’d expect for a vehicle in its class. On-center feel is superb, but do not expect direct road feel from this steering system. Braking is solid with a strong system behind it. Expect good stops in normal and panic situations. The entire Ford Expedition line comprises of two lengths – standard and Max – and three trim levels – XLT, Limited, and Platinum. The base price for the entire line is $51,790. My Limited tester came with some key options for a sticker price of $70,155. For a few thousand dollars more, you can upgrade to the Platinum model, where you get everything – and I mean everything. All kidding aside, the Ford Expedition is the best in its class. It is not because of what it offers, but how it executes. It does not offer a cliché, but a solid family vehicle that fits perfectly for those looking for one to fulfill a growing family. I will venture that it does everything better than its competitors – including the trio of GM large SUVs. You can also throw in the Sequoia and the Armada in the mix, but the Expedition will find a way to make a better argument for itself. 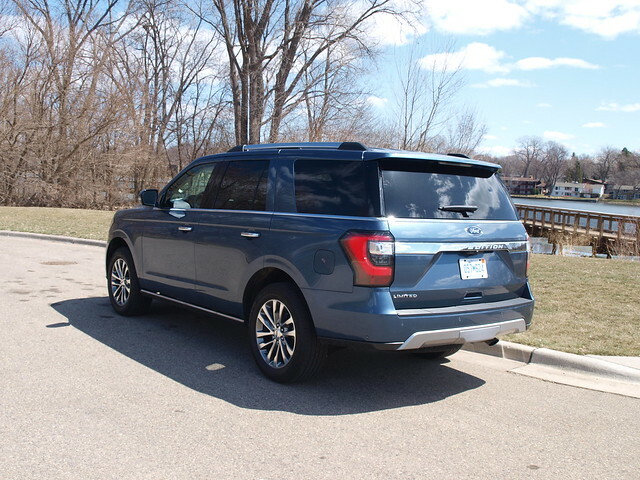 If you happen to live in that enclave of communities west of Minneapolis, surrounding the purified waters of Lake Minnetonka and want a big SUV that will satisfy the family – just get the new Ford Expedition. You will be happier, your kids will be happier, and it will make the parking lot outside our favorite restaurant look much cooler than before.